Caramelized mushrooms are one of my favorite side dishes. Who doesn’t love the delicious taste of these slowly cooked mushrooms that take on a lovely caramel color and a boat load of amazing flavor. This recipe is super easy to make and a must have addition to any side dishes recipe collection. Cooking mushrooms this way requires a bit of technique, since this vegetable has a high water content and releases juices while cooking. But don’t just settle for raw mushrooms on salads when you can get the amazing flavor that this dish delivers. There are so many ways to use this versatile vegetable and caramelizing them is one of my favorite things to do. I love to caramelize onions and other vegetables that have an innate sweetness. It allows that sweet taste to come to the front and gives the vegetable a much different taste. Mushrooms are another great veggie that is perfect for caramelization and it’s a lot easier than you might think. 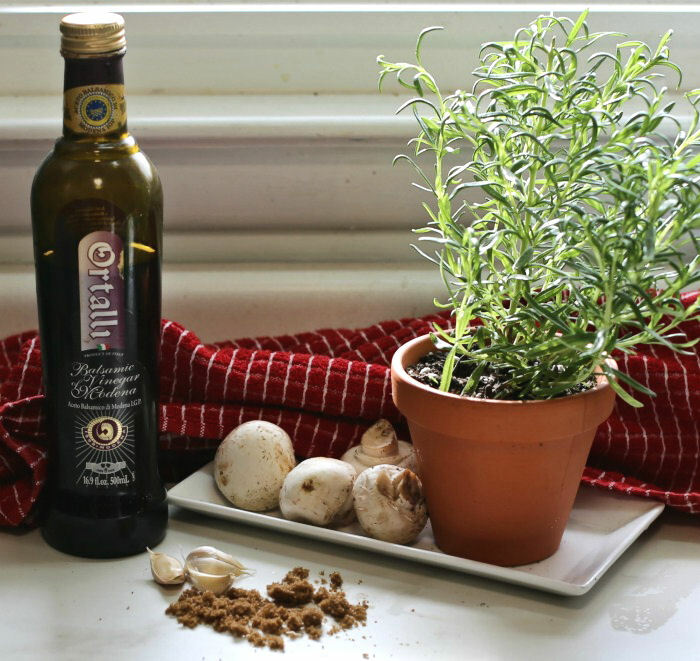 Mushrooms have a lovely earthy flavor on their own, but add in some balsamic vinegar. Mine was flavored with rosemary for extra flavor. I also used a generous helping of garlic and some brown sugar cooked in butter and oil to release the natural sweetness and take the flavor to a whole new level. The secret to cooking good caramelized mushrooms is to leave them alone. Seriously. Put them in the pan and walk away. Go have a glass of wine and catch up on the day with hubbie. Watch some TV. Whatever… Just don’t hover over the cooking pan! If you stir them too often or crowd them, they will steam. You do not want to serve a soggy mess of cooked mushrooms that look like something that might be served on the top of a bad pizza. What you want are rich flavorful mushrooms that have caramelized from undisturbed cooking, and leaving them alone to cook does this. My husband loves caramelized mushrooms. He is fond of them cooked any way that I do them but really raved about these. We have them often as a simple side dish and they are just plain amazing on top of a good burger. 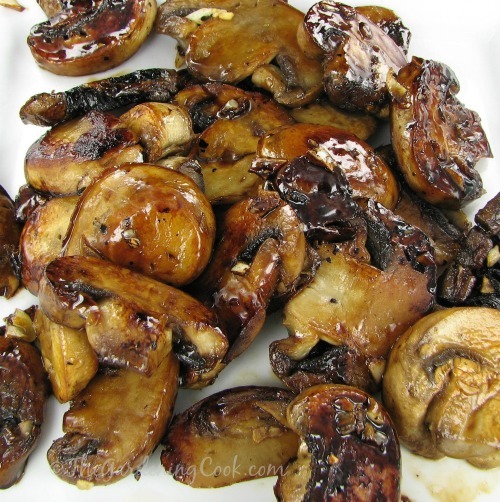 The taste is a combination of the earthiness of the mushrooms, the savory taste of balsamic vinegar, all finished off with the sweetness of the brown sugar. Try them. They will become a favorite, for sure! 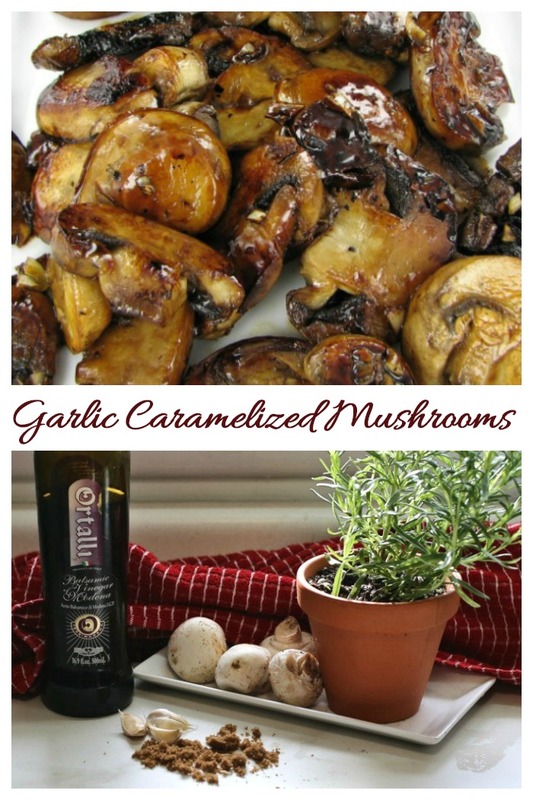 For a reminder of this recipe for garlic caramelized mushrooms, just pin this image to one of your Pinterest Cooking Boards. This recipe for savory caramelized garlic mushrooms gives the earthy taste of mushrooms a naturally sweetened boost. Turn the mushrooms and cook another 4 minutes undisturbed. Stir in the crushed garlic and cook until it is fragrant but be careful not to burn. Garlic can burn very easily. Cook for a couple of minutes. Add the soy sauce, balsamic vinegar, and brown sugar, stir a bit, and continue cooking. Now you can stir occasionally, or just shake the pan from time to time to coat. Literally one of the best thing I’ve ever eaten, completely obsessed with these. So glad you liked it Stephanie. I adore mushrooms and am always looking for new ways to prepare them. Mushrooms done this way were absolutely awesome! Adding the rosemary infused EVOO along with the garlic, balsamic vinegar, soy and brown sugar made for a really unique sophisticated slightly sweet flavor. I used the mushrooms in an Italian sausage spaghetti sauce. The mushrooms maintained their own caramelized personality and flavor even after simmering in the sauce for a couple of hours. This made my pasta sauce really stand out. Thank you for this recipe! Could they be made ahead and kept in crockpot? Hi Mary Jo. I have not tried this but I am not sure it would work out well. The secret to these being so good is the caramalization of the mushrooms. Putting them in a crock pot would make them soggy I think. They are best served right after cooking. I made these last night for my 65th birthday, to accompany some great burgers. We were fighting over the last dregs of sauce to dip our meat in. The definition of “umami” should be these mushrooms. Holy heck they were incredible. Thank you for sharing this amazing recipe. I have shared it with 600 plus Facebook friends this morning. I wish to do a stuffed pork tenderloin and would like to stuff with mushrooms. 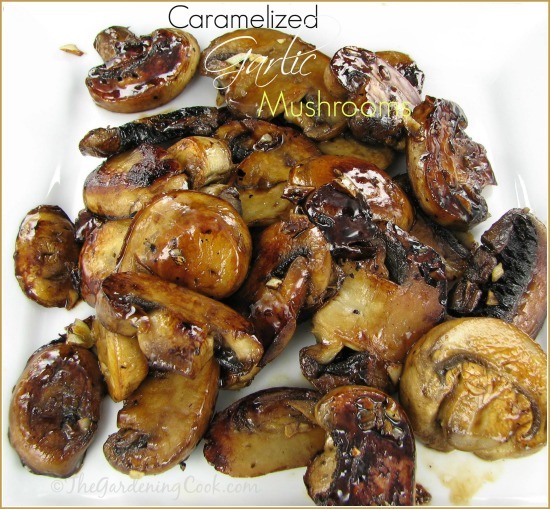 Your caramelizad with garlic mushrooms seem like a great idea, what do you think or maybe you have s better suggestion. Thank you for your recipe. I want to try them in a recipe for spinach meat loaf that I saw on Tv today . Can you provide any more details about timing/level of heat/type of pan you use? I can’t say I have much experience with caramelizing (or cooking in general!) so I’m not sure where I went wrong, but somehow I just burned everything. I used a nonstick skillet set at about 8/10. After flipping the mushrooms, I felt like they were starting to burn/oil nearly gone after only 2 minutes or so, so I quickly moved on and added the garlic which I also cooked for only less than a minute as it seemed to be burning. I added all the final ingredients and it was looking and smelling amazing, but about 30-60 seconds in everything suddenly turned black and started smoking. Guessing I just had the heat too high from the start? Would more oil help? Different pan? Anything else? And how long should they cook after you add the final ingredients? Guess you can tell I’m a newbie :)- They smelled so good at first, I’m determined to get them right! This was the most excellent addition to my filet minon tonight. I didn’t have Basamic Vinegar so I used Rice Vinegar and it is so delicious! I could make the sauce again without the mushrooms. Glad you liked the recipe Lynda! Can this be made ahead of time and reserve it in the fridge for later use? May be 3 to 4 days ahead of time? Thanks.